This comes after party leadership candidate Ric McIver participated in an event for a group that condemns homosexuals, March for Jesus. The group held its annual parade Sunday. A statement from Progressive Conservative Association of Alberta president Jim McCormick on Monday said that tolerance and acceptance were vital to the province. McIver released his own statementMonday morning, saying he does not share the beliefs of organizers. Former Conservative MP Jim Prentice is also vying to replace Alison Redford as party leader. Redford stepped down as premier and leader in March. A spokesperson for Prentice released a statement Monday afternoon saying that when he was an MP, Prentice voted in favour of marriage equality. “He has spent his entire career advocating for the individual rights of Canadians and Albertans, and also for the rights of our communities of faith, Aboriginal Canadians, and learning disabled children,” reads the statement. 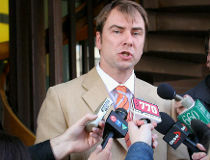 Dave Hancock is serving as the interim premier for Alberta until the party holds its leadership vote in September. There are always people complaining that politicians should keep religion out of politics. If they really think that, then it cuts both ways, and they can’t pass judgement on the practice of faith outside politics. They can’t have it both ways. You new want a christian teaching school when their is a good perverted gay atheist that can do the job …..
What the hell have we become????? ?